It’s Diwali, the festival of lights. 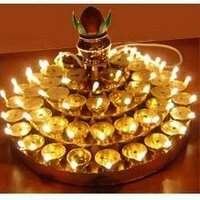 Diwali, or Deepavali, usually comes 18 days after Dasara. The festival is celebrated differently in different parts of the country. But the message is invariably that of the victory of good over evil. After sundown on Diwali, homes light up with rows of blinking diyas and smoke and sparkle of crackers fill the yards. Legend says, it was on this day that Lord Ram returned to Ayodhya after 14 years of wanderings across forests, accompanied by his brother Laxman and wife Sita. That dark night, the citizens of Ayodhya greeted Ram with rows and rows of lighted lamps. While the celebrations are centred mostly around this belief, there are other legends as well. In Gujarat, the festival is in honour of goddess Lakshmi, the goddess of wealth. In West Bengal, it is in honour of Kali. In the South, there is also the legend of Narakasura the demon. He challenged Krishna to battle and after a fierce two-day long fight, the demon was killed. To commemorate this, on Diwali, pumpkins are smashed in homes to symbolise the death of evil and people smear vermilion on their foreheads. This is followed by the ritual of oil baths, prayers and visits to the temple. Everyone at home gets up early. Have an oil massage and bath. Crackers bursting all around will wake us as early as 4 a.m. Everyone wears new clothes. There will be a long pooja – we sing bhajans and recite shlokas. My mom makes sweets and other snacks and these get distributed to neighbours, friends and relatives. 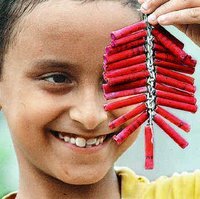 In the evening, it’s time for more crackers.It was such fun in my childhood days. I remember how all of us –– cousins, uncles, aunts, grandparents –– got together on Diwali. There would be poojas for two or three days before the festival day itself and on the final day, we had all the fun in the world. Diwali remains one of the most-looked-forward-to festival for all the good times that it brings along.